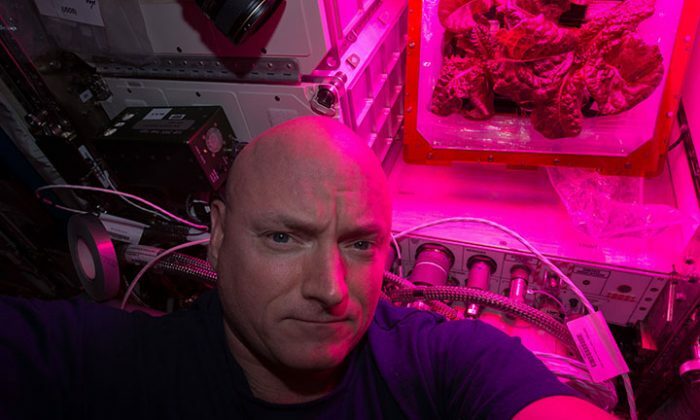 Astronaut Scott Kelly has tweeted a photo of the first flower to successfully bloom in space. But it wasn’t easy to get to this point. It all started with a project initiative named the Veggie Plant Growth System, or Veggie for short. Developed by an aerospace company, Veggie was activated in early May 2014. The first crop, red romaine lettuce, was stimulated for growth (or ready for action). However, the project faced some issues. “We lost two plants due to drought stress in the first grow out and thus were very vigilant with respect to the second crop,” said Trent Smith, Veggie project manager, according to NASA. By the second run in early July, adjustments were made from the lessons learned. After revising the amount of water they had more success. The leaves grew on schedule, and this time only one plant pillow—essentially the same as an ordinary plant grow bag—didn’t produce. And this time the crew ate the lettuce. Next, it was time for a batch of zinnia flowers. The team hoped that by observing the zinnias’ behavior, they would better understand how plants flower in microgravity. The flowers would be much different from the lettuce grown in the previous runs. “It [the zinnia plant] is more sensitive to environmental parameters and light characteristics. It has a longer growth duration between 60 and 80 days,” said Smith. Two weeks into the run, the crew started noticing abnormalities. High humidity and hindered airflow saw some of the plants starting to fold and die. The leaves had too much water built up inside, causing them to bend and flood at the roots. This became a perfect time for mold to start forming. After this, Kelly felt that gardening tasks could only be best dictated in space. This was when Kelly took the helm from the ground team. He started planning when the plants should be watered, cutting away the dead leaves, and sanitizing the plants. NASA was happy to give him full autonomy over the plants. Eventually, two of the plants survived, and started to form buds. The last run offered insight into how planting would work in future journeys to Mars. Now scientists have a better idea of what to do when crops experience drought, flooding, or mold growth. If we are going to live on Mars, then autonomous gardening with crew members taking charge of the plants is a first step. With Kelly taking the lead, Veggie plans to test run tomatoes in 2018.